Use a phone after stopping your vehicle in a safe location. If you have to use a phone while driving, exercise extreme caution at all times so full attention may be given to vehicle operation. If you are unable to devote full attention to vehicle operation while talking on the phone, pull off the road to a safe location and stop your vehicle. To avoid discharging the vehicle battery, use a phone after starting the engine. Your NISSAN is equipped with the Bluetooth® Hands-Free Phone System. If you have a compatible Bluetooth® enabled cellular phone, you can set up the wireless connection between your cellular phone and the in-vehicle phone module. With Bluetooth® wireless technology, you can make or receive a hands-free telephone call with your cellular phone in the vehicle. Once your cellular phone is connected to the in-vehicle phone module, no other phone connecting procedure is required. Your phone is automatically reconnected with the in-vehicle phone module when the ignition switch is placed in the ON position with the connected cellular phone turned on and carried in the vehicle. You can register up to five different Bluetooth® cellular phones to the in-vehicle phone module. However, you can talk on only one cellular phone at a time. NISSAN Voice Recognition system supports the phone commands, so dialing a phone number using your voice is possible. For additional information, refer to “NISSAN Voice Recognition System” in this section. Before using the Bluetooth® Hands-Free Phone System, refer to the following notes. Set up the wireless connection between a cellular phone and the in-vehicle phone module before using the hands-free phone system. 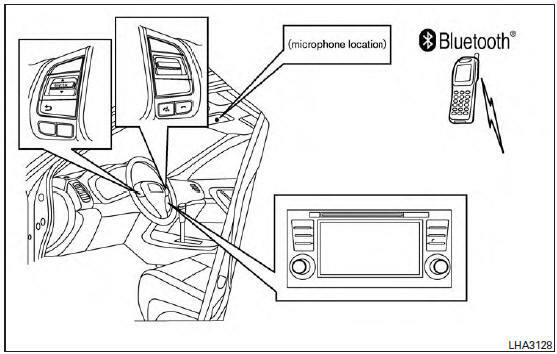 Some Bluetooth® enabled cellular phones may not be recognized by the in-vehicle phone module. Please visit www.nissanusa.com/bluetooth for a recommended phone list and connecting. Your vehicle is outside of the cellular service area. Your vehicle is in an area where it is difficult to receive cellular signal; such as in a tunnel, in an underground parking garage, near a tall building or in a mountainous area. Your cellular phone is locked to prevent it from being dialed. When the radio wave condition is not ideal or ambient sound is too loud, it may be difficult to hear the other person’s voice during a call. Immediately after the ignition switch is placed in the ON position, it may be impossible to receive a call for a short period of time. Do not place the cellular phone in an area surrounded by metal or far away from the in-vehicle phone module to prevent tone quality degradation and wireless connection disruption. While a cellular phone is connected through the Bluetooth® wireless connection, the battery power of the cellular phone may discharge quicker than usual. The Bluetooth® Hands-Free Phone System cannot charge cellular phones. If the hands-free phone system seems to be malfunctioning, refer to “Troubleshooting guide” in this section. You can also visit www.nissanusa.com/bluetooth for troubleshooting help. Refer to the cellular phone owner’s manual regarding the telephone charges, cellular phone antenna and body, etc. The signal strength display on the monitor will not coincide with the signal strength display of some cellular phones.